For the first time in four years, Americans are less accepting of LGBTQ people in a dangerous yet not wholly unexpected reversal of progress. GLAAD released the findings from its fourth annual Accelerating Acceptance report today and they show that the attacks on the community by the Trump administration are having a real effect. Less than half of non-LGBTQ adults, 49 percent, reported being “very” or “somewhat” comfortable with LGBTQ people across seven situations, down from 53 percent the previous year. Alarmingly, this is the first time the Accelerating Acceptance report has shown a decrease in acceptance for LGBTQ people. 55 percent of LGBTQ adults reported experiencing discrimination because of sexual orientation or gender identity, up 11 percentage points from the previous year. 30 percent of those polled said they would be uncomfortable to learn a family member is LGBTQ, up from 27 percent last year. 31 percent reported that they would be uncomfortable to have their child taught by an LGBTQ educator, up from 28 percent last year. 31 percent also said they would be uncomfortable to have an LGBTQ doctor, up from 28 percent the previous year. The national survey was conducted online, from November 16-20, 2017. In total, 2,160 adults were polled, 1,897 of whom are classified as non-LGBTQ. 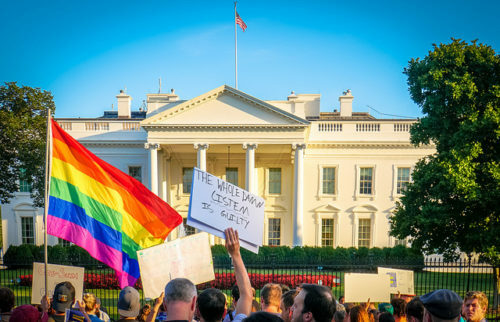 The Trump administration has attacked the LGBTQ community in a number of ways in its first year, including an attempted ban on transgender soldiers, siding with those who wish to discriminate against us in employment, healthcare, and public services, ensuring a pride flag didn’t fly on federal property on National Coming Out Day, fired the remaining members of his HIV/AIDS council without explanation, and appointed anti-LGBTQ lawmaker Sam Brownback to lead as the “religious freedom” ambassador. He was confirmed yesterday, with a tie-breaking vote from Vice President Mike Pence. You can read the full report on GLAAD’s website.